Brazil and Vietnam need to continue efforts to effectively implement agreements signed by the two countries while negotiating new ones, contributing to further developing bilateral relationship, said Brazilian President Michel Temer said. Temer made the statement at a meeting with Vietnamese Ambassador to Brazil Do Ba Khoa who presented his credentials on January 19. He spoke highly of Vietnam’s achievements in its renewal (Doi moi) process as well as the country’s increasingly important position in the region and the world. Ambassador Khoa affirmed his hope for the further development of the Vietnam-Brazil comprehensive partnership in the coming time, for the sake of the two peoples. He expressed his joy at the Latin African nation’s economic recovery in spite of global economic difficulties, adding that Vietnam appreciates Brazil’s important role in the region and the international arena. The diplomat highlighted the encouraging development of the bilateral ties in recent times, especially in economics and trade. The two sides need to enhance exchange of all-level visits and seek measures to tap cooperation potential in politics-diplomacy, economics-trade, culture, science-technology between the two countries’ localities and organisations, he said. 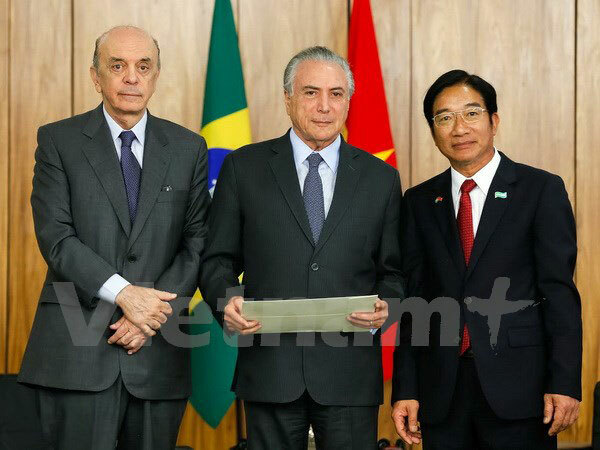 He called on the Brazilian Government to facilitate Vietnam’s goods to make inroads into markets in Latin America, and recognised Vietnam’s market economic mechanism soon./.